Recently, I have made the plunge and invested in a modular toolbox/storage platform to increase job site productivity. While I have decided on the Milwaukee PackOut (for reasons I will go into detail in a future article), there are many other great options out there that might work better for your situation. For my personal workflow, these have been a huge asset. I can build “kits” that cater to that particular job and easily transport them to the job. This has saved time, money and improved the quality of our work. Many times, employees will use what they have nearby instead of taking the time to get the proper tool or accessories. The benefits have really been astounding and I couldn’t be happier with how well this system has worked. 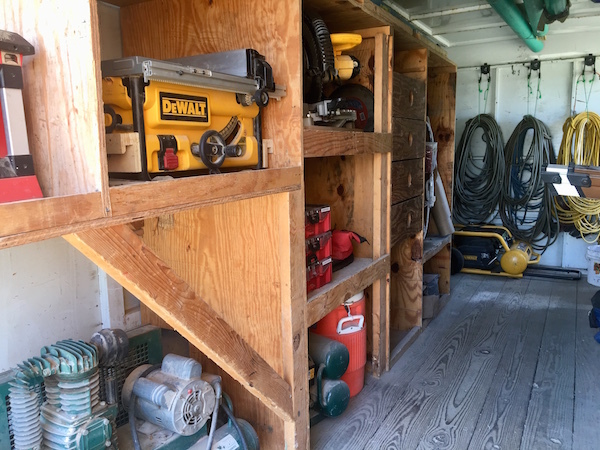 With all the benefits of the storage system, I have been thinking hard about how to best reorganize my trailer to get the most out of each day. 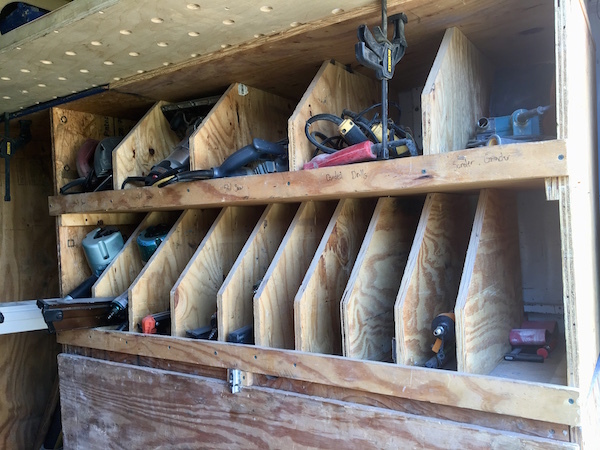 While my current setup is definitely adequate, and honestly more organized than many tool trailers I see, I feel if I plan for current and future purchases, I can greatly improve the functionality of my trailer. To begin, I took notice of the “must-have features” I need in a tool trailer. First and foremost, I want to make sure everything has a place. This will help with lost tools, inventory management, and when we roll up each day, employees will know where everything goes. If anything is out of place, I want to be able to quickly notice so I can correct the problem immediately. Although the PackOut system I use is stackable, I wanted to be able to grab individual boxes and load them for that day without having to rearrange the stack. This means that there must be shelves that fit each box so I can grab, stack, and go to work without having to fuss much with the boxes. To incorporate future tools and keep costs and time to a minimum, I need the shelves to be modular and adjustable. This will allow me to customize the trailer configuration to current and future tool cache demands. This step will also allow me to cater to any operational changes within the company itself. 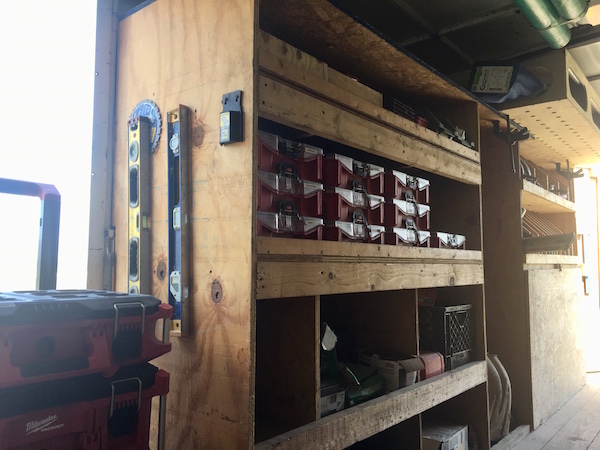 In addition to the modular tool boxes, the trailer needs to have space for step ladders, bulk material storage, and a small work area for tool repairs and other small tasks. As I began designing the trailer to incorporate these needs, I took notice of the features I currently have that work well and those that don’t. For example, I love the cubbies that hold the individual nail guns and saws, but wish that I had made them easily adjustable to accommodate different tools. I also liked that each tool has a labeled cabinet so tools are put back in the same place each day. This has helped keep the trailer organized throughout the workweek and ease a lot of my frustration when the trailer becomes messy. To incorporate the modular storage boxes, I have decided to make adjustable shelves. These will have shelf pin holes drilled the entire length of the sides used as indexing pins. I will then use pocket screws to firmly attach each shelf to the sides. I want to be able to leave my larger compressor in the trailer. To accomplish this, I will need to incorporate a cord and hose reel that will allow me to power the trailer and compressor. As the trailer will already be powered for the compressor, I want to incorporate several outlet locations and a charging station for the battery platforms I use. I would also like to have dedicated drawers for random hand tools that don’t quite “fit” with the kit idea. These would include wrenches, snips, pliers, etc. To accomplish this, I plan to purchase a top-chest style tool box. While I have started to design everything, I like to leave a little “wiggle” room for ideas that come to me later. This will also allow me to customize to some of the items I haven’t currently purchased, I.e. the tool chest. Stay tuned for updates as the build progresses.